Today we’re announcing a more complete support system for working parents around the world with a new version of the Cleo app that extends support to parents with kids up to age five. Uber, Straus Family Creamery, and eBay are joining Pinterest, Reddit and Slack as some of the latest companies partnering with us to build cultures that are inclusive of families. To accelerate the growth of Cleo among forward-thinking employers, we’ve raised an additional $27.5 million in Series B funding led by NEA, with Vanessa Larco and Jeff Immelt joining the board. The workforce is changing. As we get deeper into Baby Boom II, there are more parents (and soon-to-be parents) working at companies than ever before. A healthcare plan and caregiver leave policy used to be the only way a company could support its working parents. More and more, employers are realizing that is only one piece of the puzzle. Families are still left with an endless list of issues and questions (ex. “How do I transition from parental leave back to work?” or “How do I sleep train my baby so I can get back on schedule?”) and no clear path to finding answers that are tailored to their personal challenges. Cleo fills the massive gap between the healthcare plans that businesses offer employees and what everyday working parents need to be successful at work and at home. While healthcare plays an important role in addressing medical issues during a pregnancy and birth, an OBGYN doesn’t help with lactation or sleep training, a pediatrician doesn’t help with finding the right preschool, and a general practitioner doesn’t give you advice on balancing a job and a baby. Support for Considering, Conception, and Kids: We’ve expanded our support to include families and individuals that are considering having a baby (preconception), and also to include the still-challenging toddler years. Cleo now offers guidance for topics like fertility, potty training, and childcare to provide a more comprehensive, all-encompassing support system. New capabilities for global workforces: Many of our customers are large enterprises with employees across the globe. To meet the needs of our international customer base, we now have Cleo Guides who speak a range of different languages, from German to Polish to Cantonese. We’re proud to share that 475,000 families across more than 50 countries now work at companies where Cleo is offered, and some of the latest companies partnering with us include eBay, Straus Family Creamery and Uber. To help us meet growing enterprise demand, we’ve raised an additional $27.5 million in Series B funding from NEA. A number of executives who understand firsthand the importance of support for working parents have also made personal investments, including former Yahoo! CEO Marissa Mayer, LinkedIn CEO Jeff Weiner, Levi’s CEO Chip Bergh, Box CEO Aaron Levie, and former General Electric CEO Jeff Immelt. 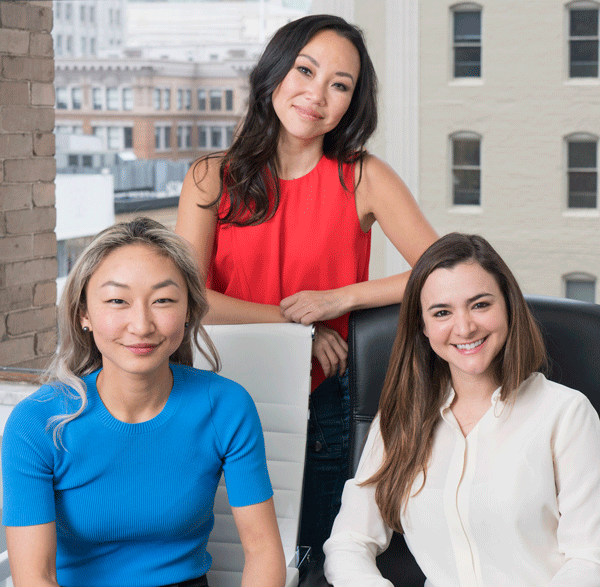 NEA’s Vanessa Larco and Jeff Immelt will join Shannon Spanhake and Sarah Guo from Greylock Partners on the board. It’s easy to see why families would need extra support during this monumental time in their life, but why should businesses care? Employers want new ways to attract and retain the best talent, foster more inclusive, diverse workplaces, and they want to save money on costly employer-sponsored healthcare plans by improving outcomes. More and more, employers are recognizing when an employee starts a family, it doesn’t need to be the end of their career. While it’s important to understand the benefits that businesses get from Cleo, we’ve been especially inspired by the families we’ve worked with along the way. We’ve helped two dads in Dublin manage their relationship with a surrogate, we’ve helped a family in Tokyo navigate a switch to donor milk for their adopted baby who wouldn’t drink formula, and we’ve helped a single mother in Utah struggling with postpartum depression. 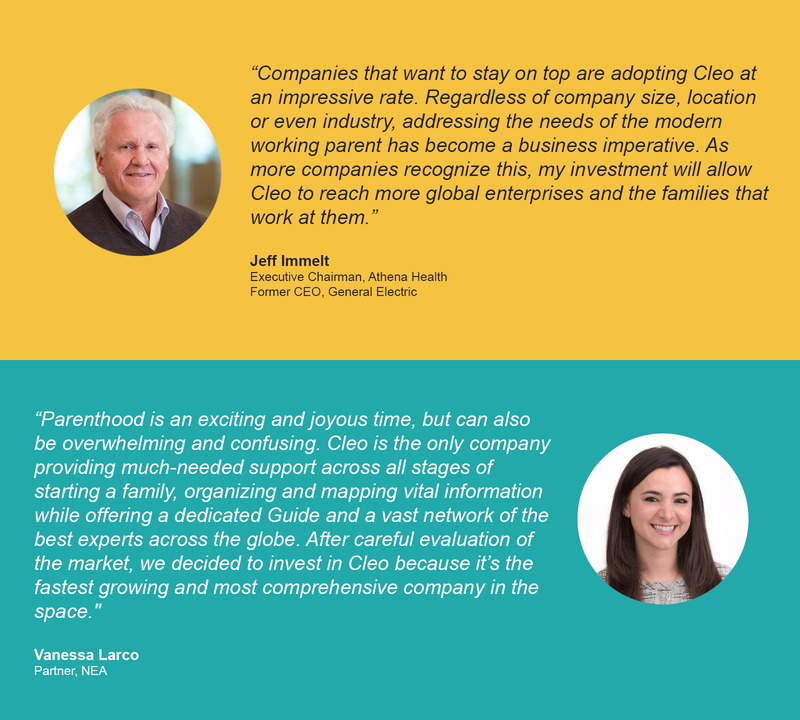 As we continue to grow, we’re thrilled by what our team has accomplished and the potential for Cleo to positively impact the lives of working parents everywhere! If you are an employer and want to offer Cleo, contact us at sales@hicleo.com. If you are a parent and would like Cleo at your company, contact us at info@hicleo.com. If you’d like to join the Cleo team, contact us at careers@hicleo.com. Visit hicleo.com for more info. A family support system that employers offer to working parents — from considering, to conception, to kids.